Perfect for those cooler outdoor days. 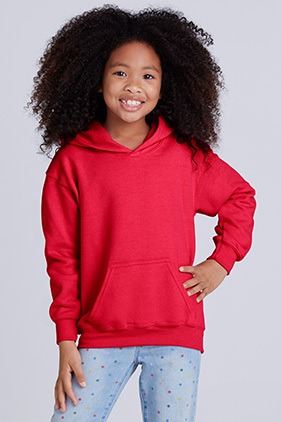 50% cotton/50% polyester 8 ounce preshrunk fleece knit youth hooded sweatshirt. Air jet yarn for a softer feel and reduced pilling. Double-lined hood. Double-needle stitching at shoulder, armhole, neck, waistband and cuffs. Pouch pocket. 1 x 1 rib with spandex. Quarter-turned to eliminate center crease. Satin label. CPSIA Tracking Label Compliant.